What is self-storage? Self-storage is an affordable, efficient way for you to store your life’s possessions or your business inventory. Self-storage makes it easy to store items of all shapes and sizes in one convenient storage location. How do I know what size I need? Create a list of the items that you are going to be storing. Choosing the right size unit will ensure that you only pay for the storage you need. Speak to one of our on-site Managers to find out what size works best for you, and then check out our helpful tips for maximizing your storage space! How long do I need storage? DE Storage recognizes the need to move your items out when the time is right. Our month to month rentals give you the flexibility to choose just how long you require your unit. What is climate-controlled and do I need it? Climate controlled storage units are temperature controlled so your treasured belongings are not exposed to extreme temperatures. Our climate controlled facilities are housed in an indoor finished building where dirt and dust are less likely to penetrate. This type of environment is ideal for storing furniture, photographs, discs/records, electronics, and other items. Do I need to have a lock? At DE Storage we want you to have the most secure unit possible. At our locations in Dover, Milford, and Millsboro we have installed high security barrel locks in every door and the lock and key set will be provided to you at the time of rental. Our units in both the Clayton and Rehoboth facilities are securable with a variety of standard pad or disc locks which are available for purchase on site or you may provide your own. How do I get my items to the unit? Many of our locations have extra wide drive aisles, allowing your rental truck or movers easy access to your unit. 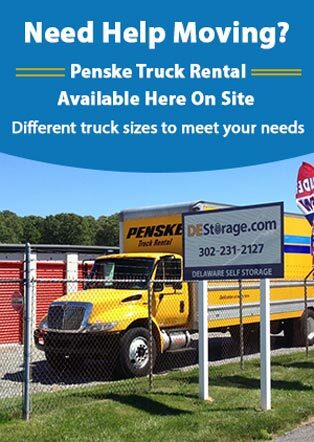 Penske truck rentals are available at Dover, Millsboro and Rehoboth.